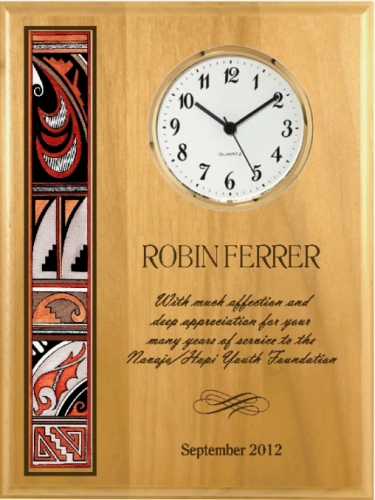 Our "Traditional" Native Heritage Clock features rich traditional Native American designs, mounted on a matte black plaque board. Includes your custom logo. 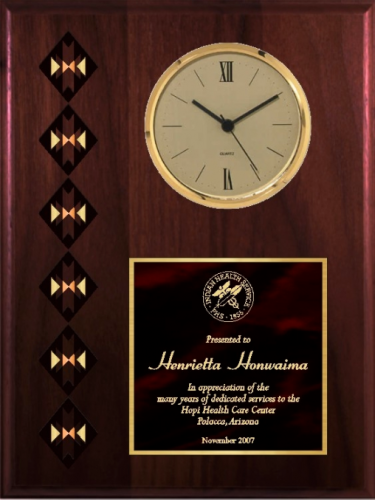 "Traditional" Native Heritage Plaque 8" x 10"
"Traditional" Native Heritage Plaque 9" x 12"
"Traditional" Native Heritage Plaque 10 1/2" x 13"
Our Festive Native Heritage Clock combines a choice of three colors of background plate with rich festive Native American designs, mounted on a gloss black plaque board. Includes your custom logo. 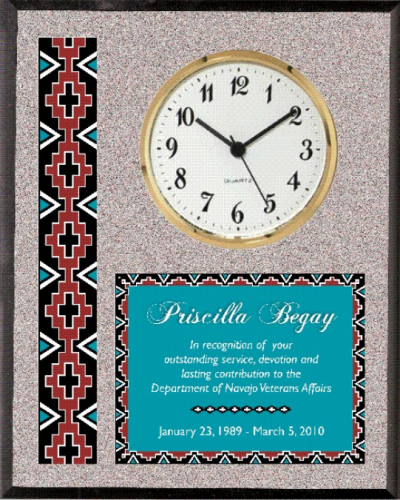 Festive Native Heritage Plaque 8" x 10"
Festive Native Heritage Plaque 9" x 12"
Festive Native Heritage Plaque 10 1/2" x 13"
Our Gold Series Native Heritage clock combines a gold background plate with rich turquoise and maroon Native American designs, mounted on a simulated walnut plaque board. Includes your custom logo. 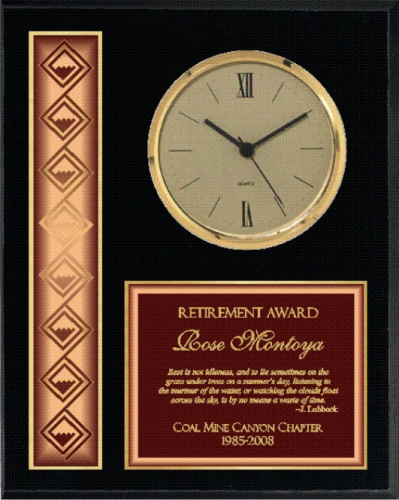 Gold Series Native Heritage Plaque 8" x 10"
Gold Series Native Heritage Plaque 9" x 12"
Gold Series Native Heritage Plaque 10 1/2" x 13"
Simulated Granite Native Heritage Clock with rich Native American border designs. 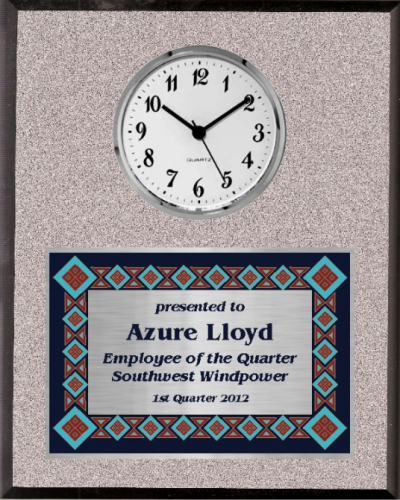 Includes your custom logo. 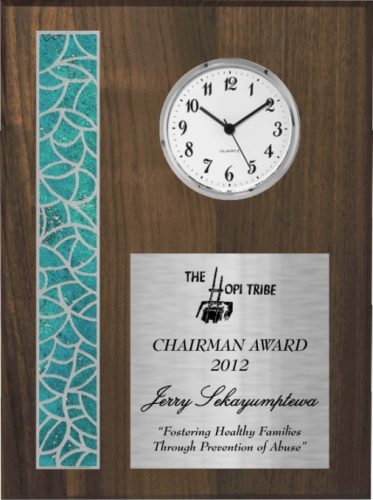 Our Silver Series Native Heritage Clock combines a silver background plate with rich turquoise Native American designs. 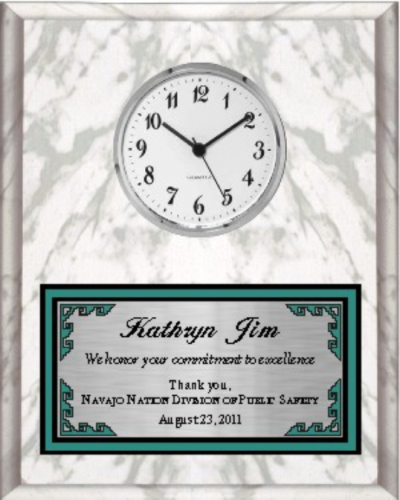 Available on either black or white simulated marble board. Includes your custom logo. 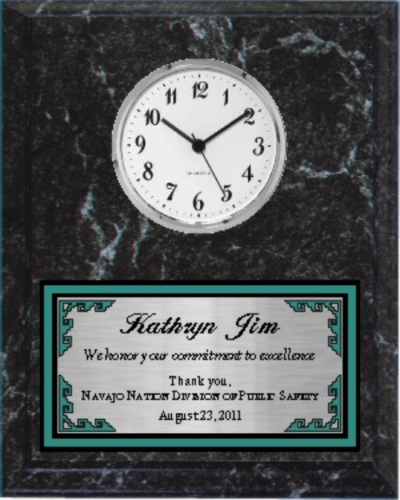 Silver Series Native Heritage Plaque 8" x 10"
Silver Series Native Heritage Plaque 9" x 12"
Solid walnut Native Heritage Clock with rich hand painted turquoise Native American Trim. 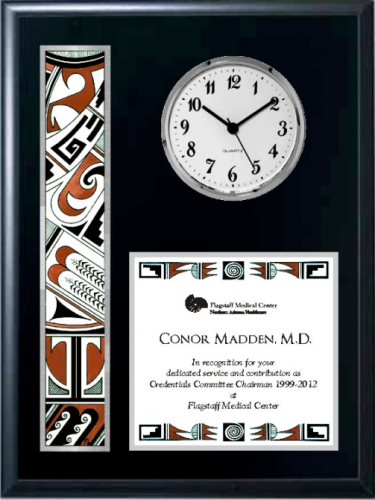 Includes your custom logo. 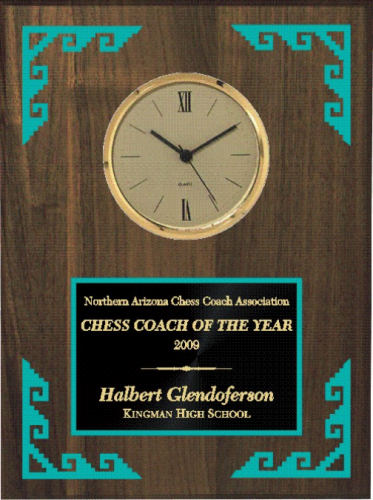 Walnut Native Heritage Plaque 8" x 10"
Walnut Native Heritage Plaque 9" x 12"
Walnut Native Heritage Plaque 10 1/2" x 13"
Clock mounted on solid walnut plaque with Native American design turquiose lasered corners. 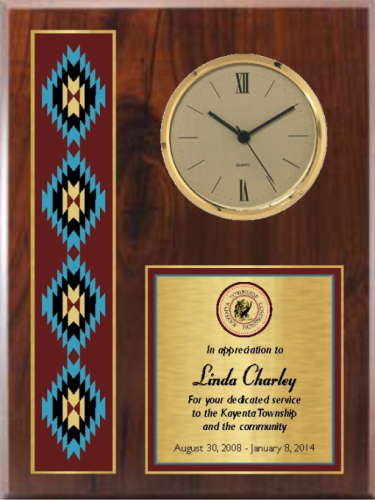 Walnut Native Heritage Clock 8" x 10"
Walnut Native Heritage Clock 9" x 12"
Walnut Native Heritage Clock 10 1/2" x 13"
Walnut Native Heritage Clock 12" x 15"